» A year of Keto! We passed the year mark of beginning the ketogenic diet! I can hardly believe we’ve made it through a whole year! What a year it has been. Gabriel has been a super star through the entire process! We literally yanked every food he had ever known and liked from his life and replaced it with tiny amounts of strange stuff. This is one of my favorite photos from very early in the diet but it makes me sad too. 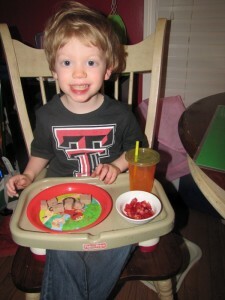 He knew how much we wanted him to be happy and like his food, so he would smile big for pictures. He loved getting to eat his strawberries and “Gabriel’s Special Candy” when we were on 3:1 ratio. I miss those bright eyes! Looking back over the last year is crazy. Those first few weeks were pure hell, he hated the food, wouldn’t drink the cream, he wasn’t getting enough calories, so he had no energy and he was still having tons of seizures. We have stuck to the diet with a tenacity I didn’t know I had. We could not have had the success we have had without hours of help from our parents, pizza angels and cooking night friends! 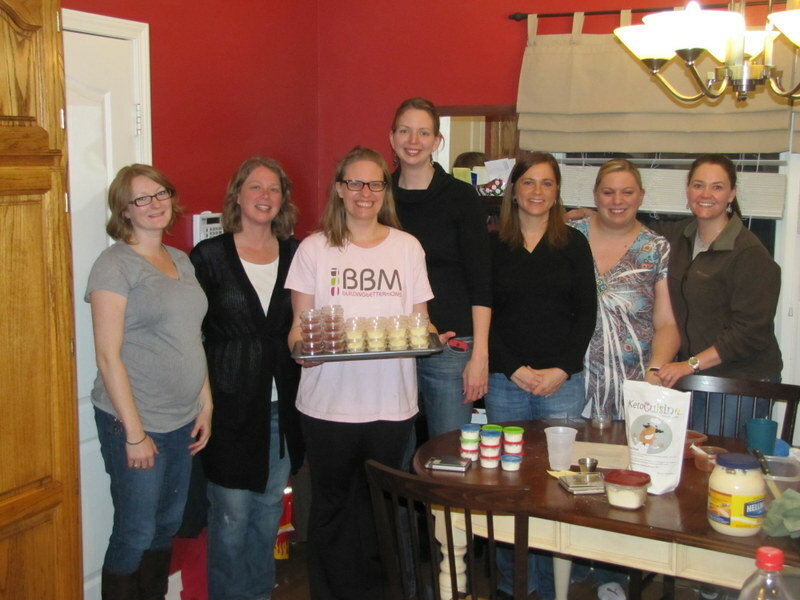 Here is a shot of the latest cooking night rock stars, showing off a small portion of our measuring bounty! Gabriel has handled the limitations of the diet like a total hero. At first, we were very careful not to eat anything in front of him that he couldn’t have. Now we eat almost anything. I don’t keep chips in the house because he really eye balls them. Several times since Christmas he has exhibited a desire for me to eat food he can’t have. He lives vicariously through me. Most recently he insists that I eat a snack bag of fish cookies at his physical therapists office. Every week he grabs a bag and brings it over for me to eat, then pulls them the cookies out of the bag one at a time and feeds them to me. What a sweet boy! I am trying to find ways to involve him in the cooking. He wants to help so bad. I have always enjoying cooking, especially baking and imagined how much fun it would be to involve my kids in the cooking process. The exact nature of keto makes that so hard. Earlier this week he was happy with his own scale, a bottle of cream and salt and pepper shakers. 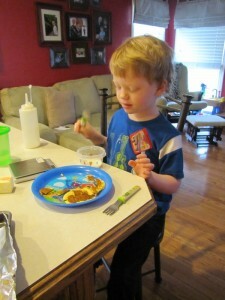 He created his own “dip” for his pancakes. We are still at 0 seizures for over a month! YIPPEE! We wish we knew what was keeping them away…it is the new meds alone? or the meds and diet combo? Chuck and I have both had several moments wondering if the diet is still necessary, however it did lower the number of gran mal seizures greatly and eliminated the drop seizures…so will keep calm and carry on, delighted in every day our boy gets a chance to learn, grow and experience life seizure free. Yeah! Congrats on making it to the one year mark and celebrating 0 seizures! I’m so happy for you. I’m praying that this is just the beginning for you. Thanks Laurie, We follow your story as our beacon of light. Wow, a year. I actually remember when you cleared through the house on the weekend, getting rid of food as it if was leaven. But to realize a year has gone by is startling, but as I think about it, and what I was doing a year ago, it makes a little more sense. My dad’s accident was a year ago on Friday. April 26th will always be the day my dad lived. Until your post today, I completely forgot and/or never connected the two events as happening in the same week. Yet, I do remember sharing with the folks at my church your stories of your early keto-days while my dad was in recovery. Continued blessings to you, my friend.